Numerous reviewers were chiefly appreciative of the soft yet structured upper of the Nike Free Train Force Flyknit. The shoe felt lightweight and comfortable for many wearers. It was flexible enough to accommodate most training activities. 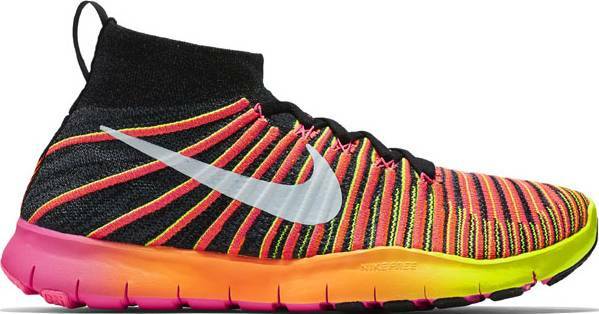 A majority of the testers reported that the Nike Free Train Force Flyknit ran small and narrow. Many users complained about the upper not being breathable and too stiff that it caused blisters. The sole unit disappointed multiple buyers because it lacked cushioning and stability. The Nike Free Train Force Flyknit received praises for its structured upper. It was deemed comfortable and able to support most typed of training activities. However, there were complaints that it ran small and narrow. The upper material was also not breathable and caused chafing. But in the end, those who were able to find the right fit enjoyed wearing the product. As a pair of trainers, highly recommended. I really like almost every aspect of this particular shoe. The Nike Free Train Force Flyknit is advertised as a versatile trainer, designed to lift, run, jump and cut. It belongs to the Nike Free family, inheriting some of its staple features. What sets this shoe series apart from other Nike workout shoes is its mission to create shoes with a barefoot, second-skin, and free feel. The upper of the Free Train Force Flyknit employs the Flyknit material which wraps the foot and ankle to create a sock-like fit. The embedded Flywire cables on the sides are interconnected with the lacing system to lock down the entire midfoot. The dual-density foam midsole is utilized to offer a compromise between cushioning and stability. The Tri-Star geometrical cuts allow the foot to bend naturally in all directions. The Nike Free Train Force Flyknit is offered in men’s version only. It follows standard measurements regarding length and is available in a variety of full and half sizes. It can accommodate a medium-sized foot as the available width is D – Medium. The shoe is wider in the forefoot to allow the toes to splay naturally during jumps and lifts. However, it fits snug in the heel and midfoot sections and may require a break-in period. The Nike Free Train Force Flyknit employs the series’ renowned Tri-Star structure. It features triangular cuts throughout the unit to allow multidirectional flexibility of the foot. The outsole is reinforced with solid rubber pods on the heel and forefoot sections for grip and traction. These pods are strategically placed in the high-wear areas to protect the midsole from abrasion. The dual-density foam is utilized in the Free Train Force Flyknit. It strikes a balance between firmness and flexibility to accommodate different kinds of training activities. A drop-in insole provides an extra layer of cushioning. It can be removed to achieve a more grounded and less plush underfoot feel. The midsole extends past the upper in the forefoot section to form an outrigger. It creates a more stable pressing surface for weightlifting and helps in maintaining balance during lateral movement. The full Flyknit construction of the upper in the Nike Free Train Force Flyknit creates as a soft yet supportive fit. The material is a bit more open in the areas that require flexibility and is more tightly-woven in the sections that need more structure and support. This proprietary material can be found on another popular workout shoe from Nike, the Train Ultrafast Flyknit. The embedded Flywire cables on the lateral and medial sides stretch up to form eyelets for the laces. This combination serves to lock down the entire midfoot. The use of an internal heel cup contributes to the stability of the heel. The mid-rise collar wraps the rearfoot for additional ankle support. A pull tab is placed at the heel for a fast and easy on-and-off wear.